One of my go to place whenever I'm in the mood to shop and dine (or is it to dine then shop) is Mega Fashion Hall at SM Megamall. But then, I didn't go there last week to shop, (Booh!) I went there to try Alqueria tapas, bistecas y paellas . 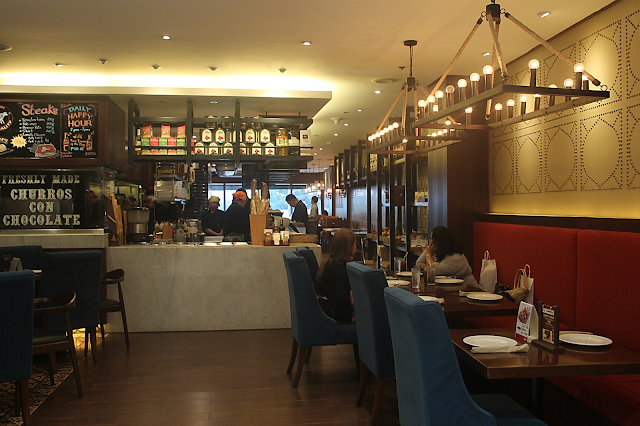 Owned by the Sumo Sam Group headed by Manila's top celebrity turned restaurateur, Marvin Agustin, Alqueria is one of the restaurants in Mega Fashion Hall that's been written so many times. It used to carry the name Boqueria but after a year of using it they had to change it for some legality issues. Had to say, I was really sold on this Spanish-inspired restaurant, especially on how the interior was elegantly designed. From it's namesake, an alqueria is a dwelling which evolved through time, what was once a farmstead to a palace-like building for the landlords. It was said that only a few alquerias in Spain are left and are being preserved, now being used for agri-tourism. It's unlikely that one may somehow look at this as an allegory. If you know Marvin Agustin, as I did, belonging to the same era, you may know his background. His life story is a classic example of "from-rags-to-riches." Maybe it's just me, but I kinda feel the inspiration brooding out from every restaurants he owns or co-owns. 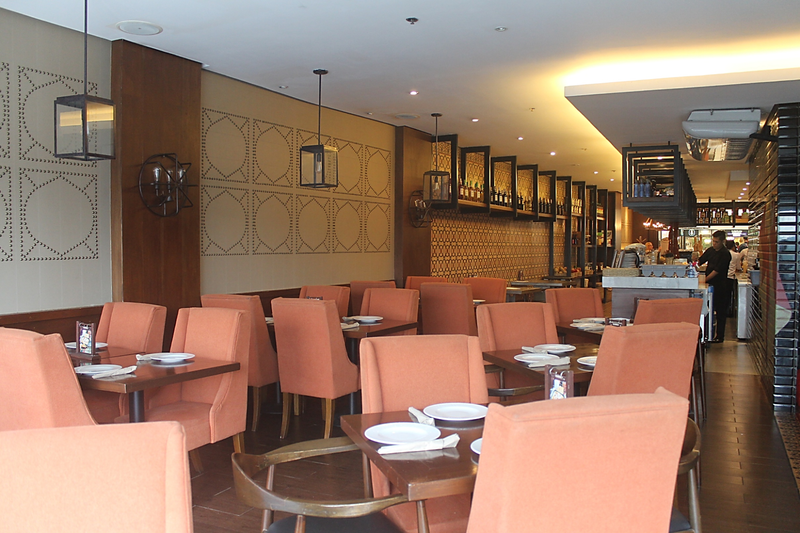 Going back to Alqueria, as I've mentioned, probably getting the inspiration from a typical Valencian alqueria, some farm-house elements co-exist with contemporary furnishings inside the resto. The major eye-catching figure you will see upon entering are the overhead light fixtures. The simple metal frame added with candle-like light gives that rustic-feel. You might not notice but the two walls doesn't have the similar look. On one side, arrayed are black subway tiles painted with the iconic Flamenco dancer and matador. While on the other side is a light mustard wall embellished with metal studs. Another great feature is the open kitchen and bar where you can take a peak into the kitchen's hustle and bustle. 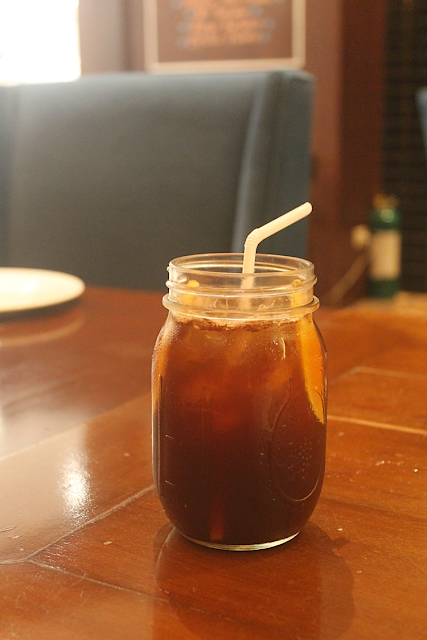 While adoring the fine trimmings of the restaurant, my beverage came and of course it has to be in a mason jar. From amongst a few choices of house-brewed iced teas (mint, etc) I had cinnamon iced tea. I thought it was going to be remarkable but it was just regular iced tea dabbed with powdered cinnamon. It would be better if it's cinnamon infused albeit the powder. 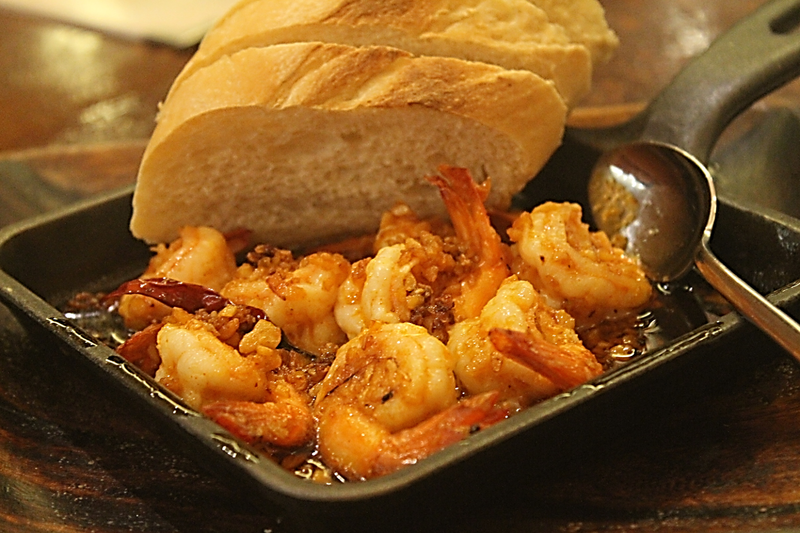 Alqueria is known for their tapas, a small sharing of some Spanish savory dishes like Gambas al Ajillo. If you don't like it oily, then you better get other starters but still the flavors are in the oil-based sauce, after all olive oil is used in it. The fresh white river shrimps were succulent and have a marvelous garlicky taste, a hint of paprika and some more spike of spicy flavor from red bell pepper flakes sprinkled on it, give it's dignity. I love finishing off my oil plate surface with the bread that goes with it as well. 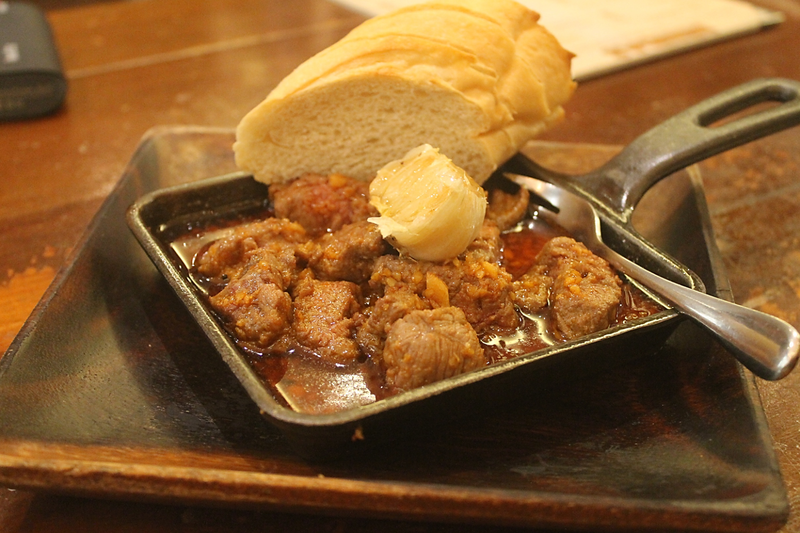 Another fave amongst their regular diners is the Salpicao (Php445). Instead of serving it in smaller cuts, the tenderloin was cubed bigger than the norm, yet still prepared the traditional way. For me, this is best eaten with steamy plain rice. I would drizzle the garlic-infused oil all over it and gorge on the tender beef like there's no tomorrow. However, since we will be served paella, I didn't mind eating it like how you savor a true Spanish tapa. Paella is one of those dish that I'm afraid to cook at home. For one, the ingredients are not inexpensive, so making a mess out of the ingredients might just be disappointing. So it's so comforting to know that there is a place to serve up a good one for those major paella cravings. How can you say no to a salver filled with short grain rice cooked in saffron-infused stock and pomodoro. Making it more adorable are the shrimps, mussels, squid and pink salmon crowned at the top. 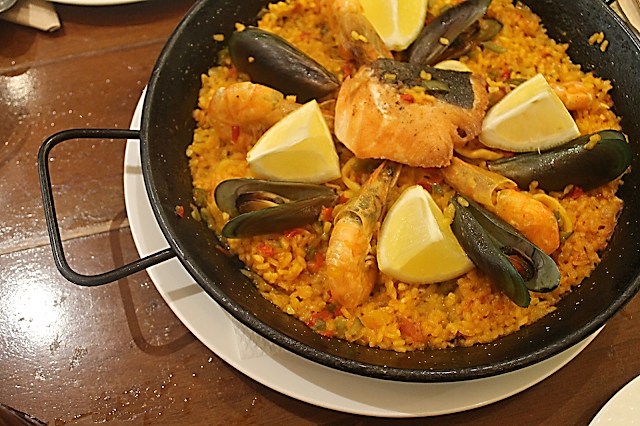 This Fisherman's Paella, just made it on top of my Paella crave-list. Whether you pronounce it as /pa-el-ya/ or /pah EH yah/, what matters most is it's downright flavorful and rustic. 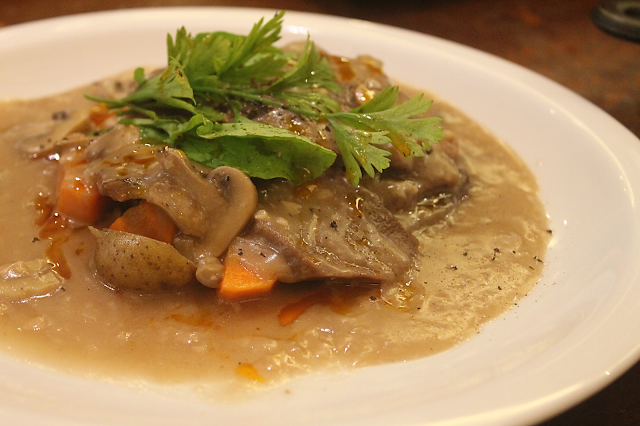 To make a great lengua, the meat has to be cleansed off it's outer skin and having enough cooking time to attain that tender-springy textured meat. If you're extra keen on trying out exotic foods but have been putting it off due to it's oddness, you can start with ox tongue, thank me later... But make sure to have it here at Alqueria. If you're a steak aficionado, you know that Prime ribs are reserved for those special occasions, of course, the price is also, well, prime. But Alqueria's Prime Ribs Solo seem to debunk that, they serve a solo-sized prime ribs, bone in and prepared to your liking, at an affordable price of P 1,499. Prime Ribs solo is a huge cut with a plate complete of it's trimmings- garden salad, buttered veggies and top-notch gravy. 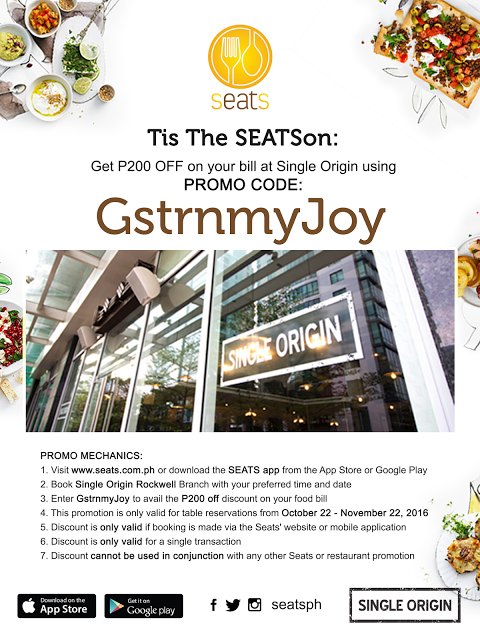 Cochinillo Sisig (Php688) is definitely not-your-ordinary Sisig. 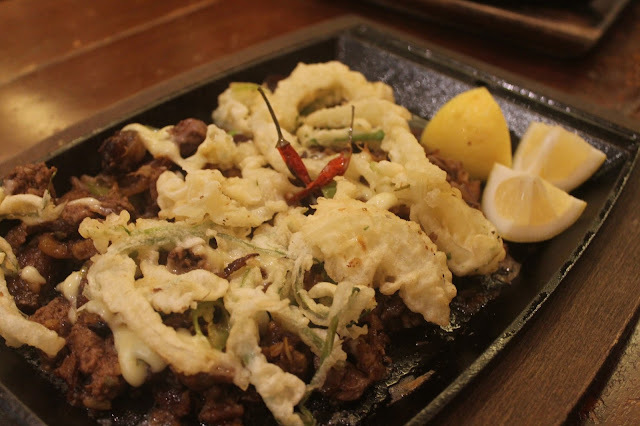 Carvings of cochinillo or suckling pig is made into sisig, flavor amplified with lots of herbs and spices. A traditional cochinillo is cooked only with salt and water, then roasted on a pit of fire, so expect it to be a bit salty. I suppose you'll be ordering steamed rice for this. 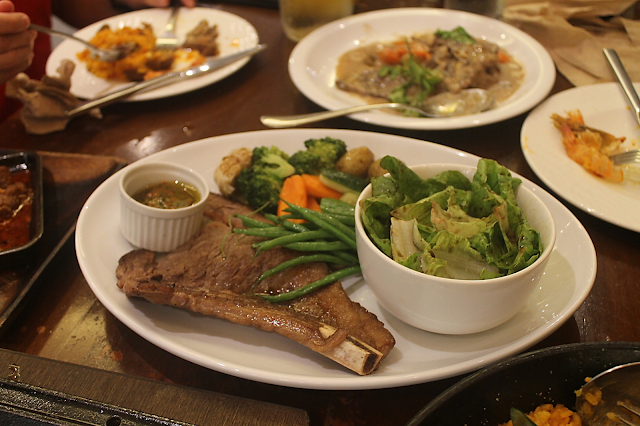 For a price of P 688, 2 to 3 diners can share with a plate of this. The addition of batter-fry onion strips on top makes this a glorifying dish. 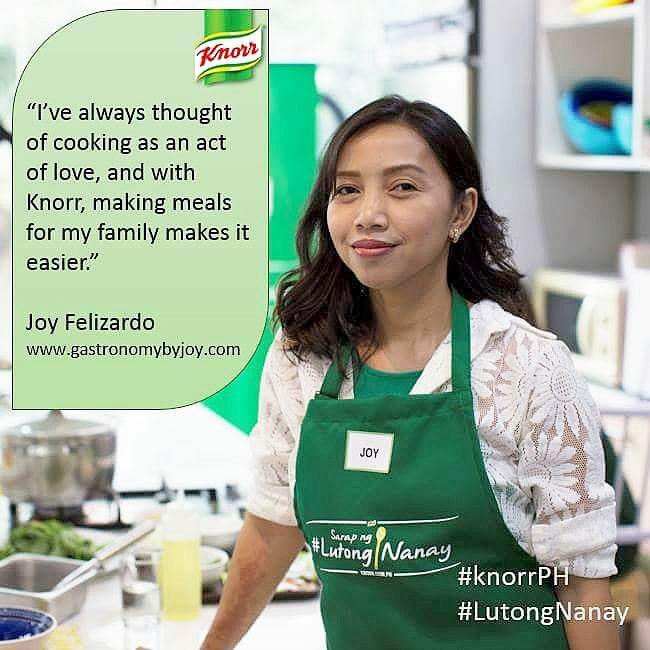 To hasten it's saltiness, try to squeeze some lemon juice, it'll do the trick of elevating the flavor of the dish. You'll be surprised at how I've engaged on this kind of lunch and still left a room for dessert. 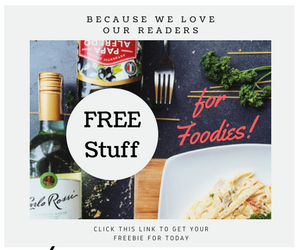 Even I, myself was surprised, nevertheless, I loved everything I've tried, but made sure to eat in moderation, since most of them are heart-attack inducing. When I was led to our reserved table, I noticed a shelf full of Valor chocolates. Apparently, they do sell them and they also use them in their dessert menu. 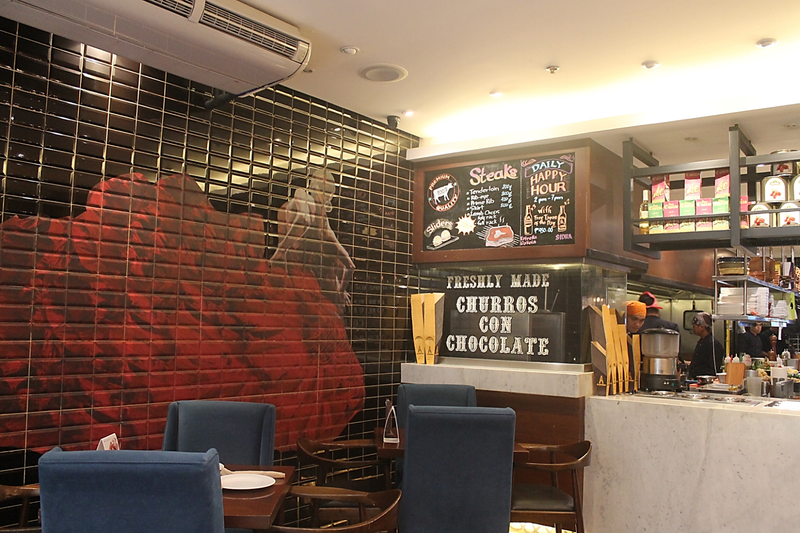 A relevant instance is their Churros con Chocolate. I've been seeing a lot of churros-maker or what they call churreria but have only tried one and I didn't like it. I still didn't loss faith over the churro. Every foodie is going gaga over some famous churreria in some malls and as sorry as I am that I still haven't tried them, a gander of hope is what I'm holding on to. For now, let me go back to how I have devoured a couple of these babies. Long, warm, crunchy, cinnamon-dusted, warm dark chocolate dip, child-hood memories, first kiss. 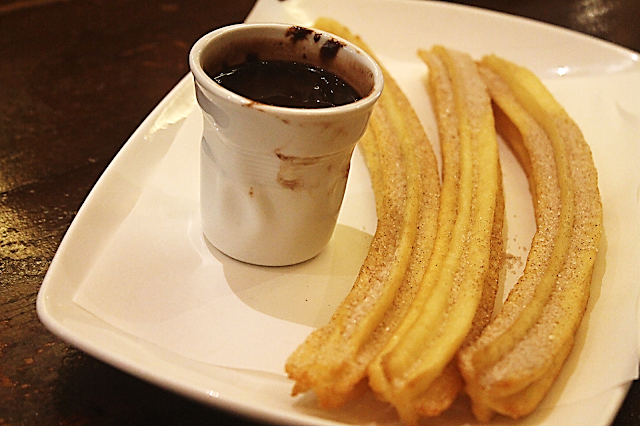 These are what make up a happy and contented life, and yes, Alqueria's Churros are included. 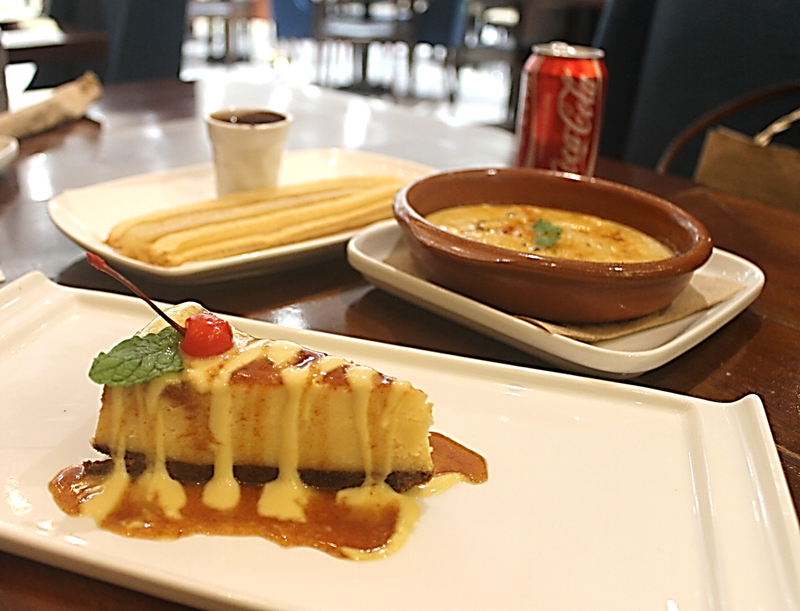 When you want dessert to be fab but in the boundary of being delectable and comforting, think of Alqueria's postres. When you want something light, creamy and sugary to cleanse of the savory after-aste, Crema Catalana (Php138) should be your choice. It's a cross between panna cotta and our very own leche flan, the milk and egg taste from the custard with the finer and thinner texture of Panna cotta. Candied caramel sauce lays beautifully on top giving you an experience of breaking a thin glacier-like covering before digging on the soft custard. But if you want a heavier dessert, something you'd want to cap a meal together with a cup of tea or coffee, better get the Manchego Cheesecake (P 230). And yep, another one of those not-your-ordinary dessert, coz I had a bite of this not-your-ordinary cheesecake. I mean, where can you get a cheesecake that uses Manchego cheese and cream cheese at the same time. 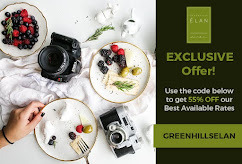 You know what, there is that great balance between the sharpness of the Manchego and the creaminess of the cream cheese and this just me want to go back anytime to Megamall and order me a slice of this, especially for those moments you just want to unwind. I'd rather have that moment rather than scratching my credit card and thinning the soles of my shoes from shopping. A narrative with The amazon online marketplace rolex going making use of the project with Hans Wilsdorf along with brilliant brother-in-law Alfred Davis who seem to in progress breitling replica developing company in just 1905 around London, uk. Most people started out their “Rolex Look at Company” in just Geneva, Swiss and even Wilsdorf accepted Rolex timepiece for the reason that its ground breaking trademark. rolex replica has become a sophisicated small business labeled the earliest show them everywhere a person's water-proof look at instance, every look at which includes a time for them to a call, plus enable you to showcase not one but two time frame areas. rolex replica watches has additionally ended up among the list of initially styles that they are mixed up in building by using quartz action swiss wrist watches. For a sign with style plus posture, replica watches timepiece is actually a substantial big method among the list of women and men who seem to unquestionably have got a desire for getting creator different watches and even proceed pushing up their group. For girls, using tag heuer replica sale is not only just simply a strong emphasis to make your wearing, its on top of that a different exceptional patch of identity plus intricacy.